The Caumont Property is made of four non-adjacent claim blocks totaling 105 claims spread over 42 kilometers in the eastern part of the Lac des Montagnes volcano-sedimentary formation. These blocks are identified as Nemiscau Lake, Kename, Caumont West and Caumont East and are covering an area of 5,610.70 ha. A Hydro-Quebec power line crosses the southern part of the Nemiscau Lake block in a NW/SE direction. This block can easily be accessed by road up to the Lac Nemiscau, located close to the west boundary of the block, and then by boat. 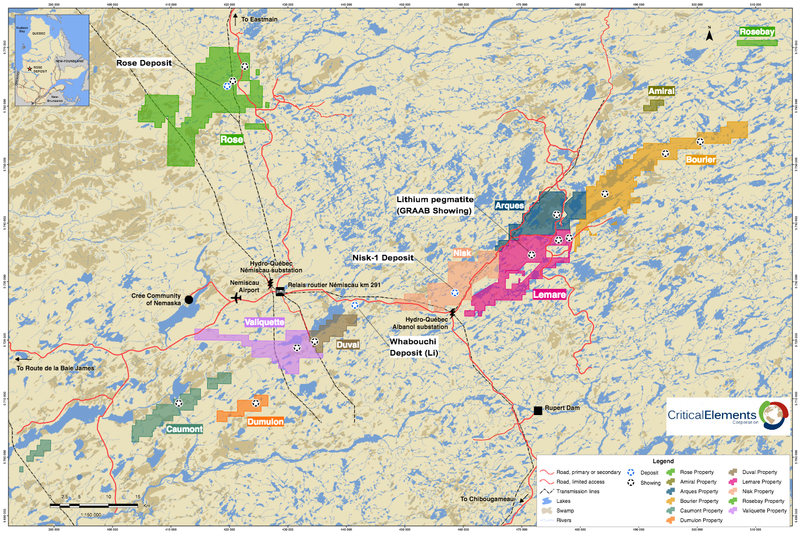 The Kename block is located East of Lac Kanamakuskacik and South West of Lac de la Sicotière. It can also be accessed by road. The Caumont West block can be accessed by plane, landing on Lac Caumont, or directly by helicopter. The Caumont East block can be accessed by helicopter. The Caumont project offers strong lithium potential in a well-established area. The lithium pegmatites tend to occur in swarms in the volcano-sedimentary units. The Caumont property covers a large part of the regional volcano-sedimentary unit, a favourable unit that hosts Nemaska Lithium's Wabouchi deposit and the Lemarre showing. The four blocks forming the property are located in the eastern part of the Lac des Montagnes volcano-sedimentary formation. The formation is locally composed of amphibolite quartz-rich paragneiss, biotite and sillimanite-bearing schist, pegmatite, basalt and ultramafic intrusives. Associated to the Tent showing, aplitic dykes overlapping the mafic and ultramafic rocks show a gold potential. The best values returns up to 4.29% Cu, 4.34 g/t Au, 16.65 g/t Ag and 1.74 g/t Pd. Mineralization could be due to remobilization of the host rock mineralization. 100 m east of the Tent showing, the grab sample L943057, collected in a muscovite rich metasediment with 15% arsenopyrite and quartz veins, returned 1.6 g/t Au. A dozen meters from this sample, the grab sample L943077, collected in a metasediment with 20% garnet porphyry, 5% arsenopyrite and 5% pyrite returned 0.219 g/t Au. At the west end of the Caumont West block, a metasediment with mineral segregation (alternating silicified bands with chloritic bands) with traces of sulphides was sampled. The grab samples L943046 and L943418 returned respectively 0.239 g/t and 0.167 g/t Au.